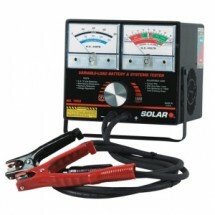 Powerful, long-lasting and durable come to mind when showcasing our selection of battery chargers, battery testers and jump starters. We carry, Clore Automotive, SOLAR, Booster PAC, Schumacher, DSR, Christie, and last but not least, Jump ‘N Carry. And we offer multiple styles from wheeled and bench top battery chargers and testers to wheeled, hand-held and heavy-duty jump starter systems in which to choose from. So why wait? We have the selection and top-quality brands to satisfy your shop’s most immediate and longer-term needs. For a limited time - Free Tee Shirt with select model Jump N Carry battery jump starters / booster packs ! 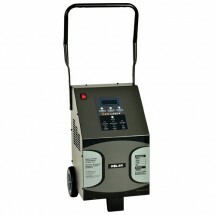 When you purchase an automotive battery charger by Schumacher or Solar, you know you are buying quality. 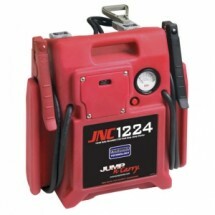 When you purchase a car battery booster pack, you know you can't go wrong with Jump N Carry or Booster Pac. We could have gone with any of those cheaper, no name brands out there. But we know our customers demand products designed for professional use. Latest product innovation has really been felt in the automotive industry especially with battery chargers. Clore Automotive’s new Transoid technology runs cooler, consumes less power, and is quieter than traditional battery chargers. SOLAR battery chargers are so advanced that they help extend of the life of a battery too. And, the company's Pro-logix model actually “talks” to a battery to determine the type and condition of the battery then uses its four unique charging phases to re-charge and restore battery. Nobody makes battery chargers and jump starters better. And we've got all the car battery starters right here. Give us a call if you need advice on which model is best for you. Our experts are here to steer you in the right direction.